The Historical Society of Plainfield will host a lecture entitled “Reclaiming Our Voice: New Jersey’s Central Role in the Fight for Woman Suffrage” on Sunday, March 24, at 2 p.m. at the Drake House Museum. 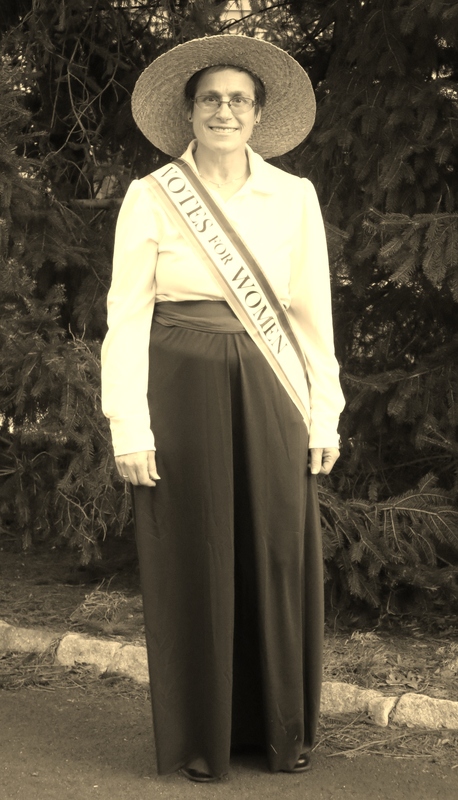 Carol Simon Levine will be portraying Lillian Feickert, president of the New Jersey Woman Suffrage Association from 1912-1920, who lived in both Plainfield and North Plainfield. She will tell the story of the role of New Jersey women in the long struggle for women’s suffrage. Two hundred and twenty-five years ago, women had the right to vote in only one state, New Jersey, a right they would lose in 1807, and not win back for more than five generations. New Jersey’s role in the struggle to regain that right is largely overlooked. It is well-known that Elizabeth Cady Stanton proclaimed “all men and women are created equal” at the Women’s Rights Convention of 1848 in Seneca Falls, NY. Few know that she lived in Tenafly in 1869, when she and Susan B. Anthony founded the National Woman Suffrage Association and wrote the first three volumes of their History of Woman Suffrage. Few realize that Lucy Stone was a resident of South Orange in 1858, when she refused to pay taxes, stating “No Taxation Without Representation.” She was still there in 1869, when she and her husband founded the American Woman Suffrage Organization. The previous year, Portia Gage and 171 other Vineland women (including four “colored” women) literally took suffrage into their own hands when they brought their own ballot box to the polls in order to cast their votes for president. Victoria Woodhull, the first woman to run for president, launched her candidacy in Vineland three years later. Hear the stories of these and many other women with Jersey ties – including the Grimke sisters (who spoke out against slavery and for women’s rights from their home in Shrewsbury), Dr. Florence Spearing Randolph (chair of the NJ Association of Colored Women’s Clubs and executive board member on the NJ Woman Suffrage Association), Alice Low Turnbull Hopkins (who threw her considerable support behind Alice Paul’s Washington pickets), and Alice Paul, the dynamo who re-energized the movement for a federal amendment. Together their tireless efforts propelled women’s suffrage past reluctant male voters and through state and national legislatures to the final success of the 19th Amendment. Carol Simon Levin is a retired librarian, author, storyteller and program presenter based in Bedminster. In 2016, she wrote a book, “Remembering The Ladies: From Patriots in Petticoats to Presidential Candidates,” about amazing American women, which was illustrated by 36 artists. It is an interactive book about lost stories of fascinating and forgotten women in American history. In addition to a coloring page, each entry includes a short biography, a fascinating fact and a quote by the woman. It includes recommendations for further reading for kids, teens, and adults, and suggestions for activities and activism and places to visit. This program is made possible by the Historical Society of Plainfield/Drake House Museum. Please consider wearing white in a tribute to U.S. suffragists. Seating is limited and is on a first-come, first-serve basis. Light refreshments will be served. Free for members, and donations are always appreciated from non-members.